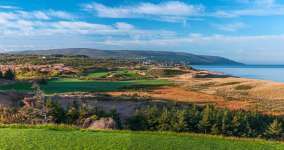 One of the most important golf courses of this golden modern era, Cabot Cliffs was designed by Bill Coore and Ben Crenshaw on a stunning clifftop site outside Inverness in Nova Scotia. The second course at the Cabot Links development, the project reinforced the philosophy of co-owner Mike Keiser, who believes that when it comes to destination golf two courses are a significantly bigger draw than one. That is especially true when the holes photograph as well as they do here at the Cliffs. 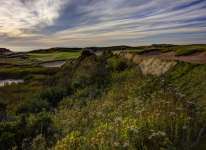 What photos don’t reveal at Cabot Cliffs, is the disparate landforms and the manner in which Coore’s elegant routing flows from hole to hole and from disparate section to disparate section. 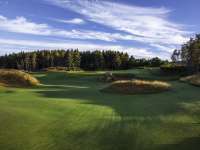 Be they draped across an upland plateau, play into or out of an attractive forest, sit directly against the cliff edge or dive down into a small section of dunes, each hole tells its own distinct story and provides golfers with a mini adventure. Though Coore’s routing is both stylish and exciting, it’s also highly unconventional. For a start the holes are arranged in two uneven loops, the outward side being made up of ten holes and the inward side of eight. Both end directly along the cliffs. The composition of par is also unusual, in that there are six par threes, six par fours and six par fives. By the time you walk off the 5th green you have actually played half the par fours. About the only awkward transitions are in getting to the 8th and 9th tees, perhaps as a result of aiming for this six-six-six type arrangement. Whatever the reason, each is easily forgiven for the quality of the subsequent holes, particularly the thrilling downhill 8th. Pleasingly, although the clifftop gems dominate most reviews there are feature holes spread evenly across the layout and across the various landforms. Even those that seem innocuous delight for either their strategic arrangement or the beauty of their physically designed features, or both. The opening par five is one such example. Shaper Rod Whitman, who designed Cabot Links, worked with Coore and Crenshaw here to convert an essentially flat plateau into a wonderfully subtle and softly undulating three-shot examination. The next is the first to enter the duneland, and the first obvious standout. 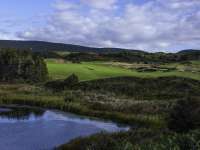 From the edge of the upland plateau, the tee shot drops down onto a broad fairway that would be impossible to miss were it not so important to play down the flanks. Here an enormous green is tucked into the dunes and protected by a marshland and nasty bunkered knoll, which makes the approach blind unless coming in from the same side as the pin. After plunging into the dunes at the 2nd, golfers leave the area briefly to play a couple of heavily undulating holes toward the interior. They return at the marvellous par four 5th, which can be drivable under certain conditions but more likely to be played as a dogleg along a shelf and around a natural wetland. Regardless of how aggressive your play from the tee, balls hit with the right shape and trajectory will bounce farther along the narrowing fairway and leave a simpler approach into the partly secluded green. The 6th is then an uncommon short hole that plays through a dune pass and to an open green site that falls away at the rear. Proof of Coore’s minimalistic tendencies, this fun hole is basically untouched and about as simple as golf design gets. Without wishing to declare one side superior than the other, the back nine certainly boasts more of the raw, natural drama and lives longest in the memory thanks to a spectacular three-hole finale directly along the coast. In truth each of the final six holes is quite brilliant, starting with the blind Alps-esque approach into the 13th and onto the charming short 14th with its green set beyond a bunkered outcrop and at the foot of a wooded ridge. From here the golf moves onto a four-hole finishing loop that is as beautiful and as fun as any in our game. 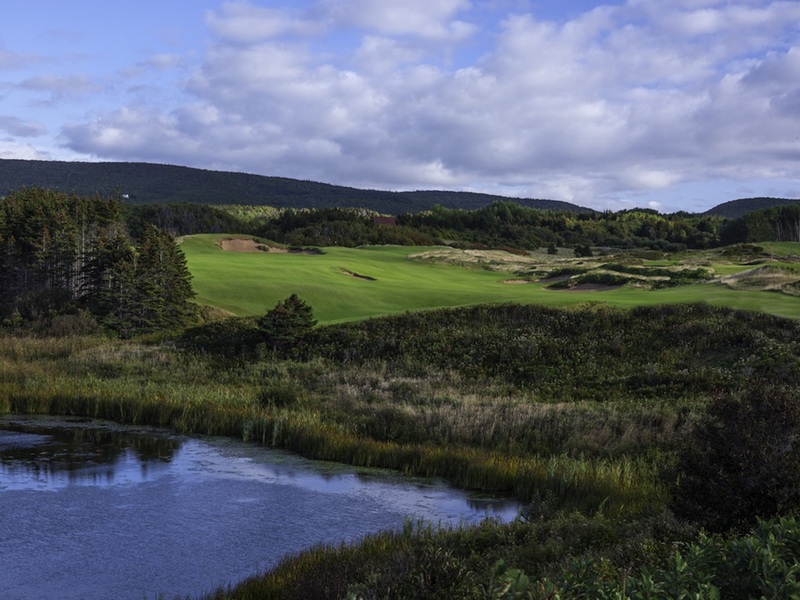 Played downhill toward the water, the 15th is a wonderful multi-route, multi-option par five and followed by a breathtaking par three from the edge of the cliff to a green dangling precariously on a small spit of land within the Gulf of St Lawrence. In the fullness of time, volumes will be written on the beauty of this one hole. Arguably more interesting to play, the short par-four 17th is also unconventional for the blindness of its tee shot across the corner of the cliffs and the manner in which balls can be bounced around a front left bunker and onto the green. As with other areas of the course, there is a resemblance here to parts of Coore’s Shanqin Bay design in China. 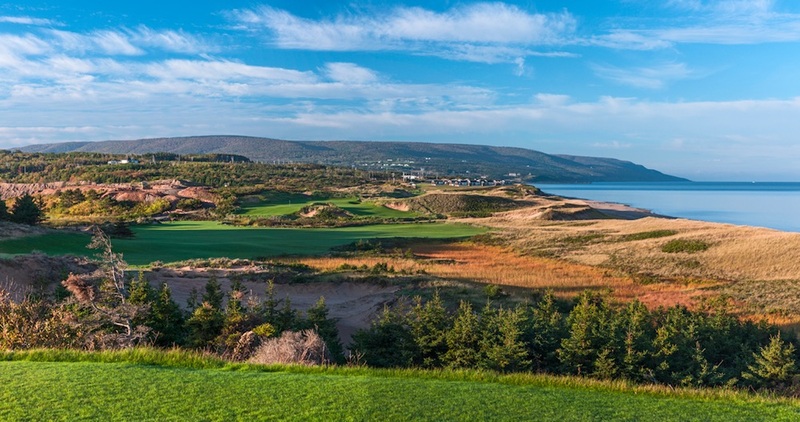 Finishing the round at Cabot Cliffs is a glorious par five directly along the shoreline, with plenty of width but bunkers eating into the fairway at key points to complicate an otherwise straightforward hole. Although you could make a strong case for the one and two-shotters, the par fives really are quite special and arguably the most interesting holes to play. That despite the other clifftop par five, the nearby 10th, lacking the sort of strategic options for average golfers found on the 18th and elsewhere. 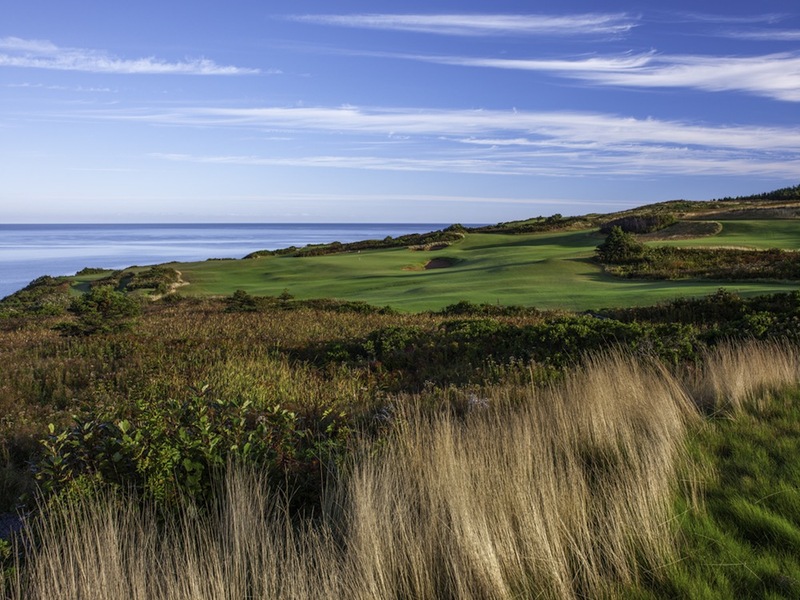 As with Pacific Dunes at the Bandon Dunes Resort in Oregon, Cabot Cliffs is one of those rare courses to have taken an established, and well-regarded, golf facility and elevated it to an entirely new level. 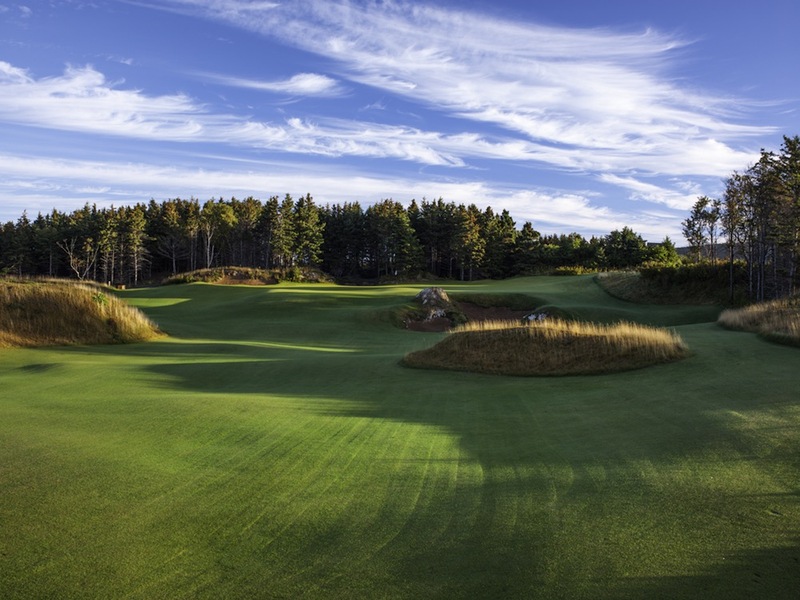 This doesn’t just complement the older Links course; it sets new benchmarks for golf in Nova Scotia and right across Canada. Cabot Cliffs isn’t perfect, no course is; but if those on the brink of quitting our great game went and played it, we would probably halt the decline. It’s very special.